Firewind and Ozzy Osbourne guitarist Gus G has issued a statement paying tribute to the late Gary Moore, who died earlier this week (6 February) of a suspected heart attack. Gus told press: "I'm very saddened by Gary Moore's passing. We've lost one of the greats. His guitar style has heavily influenced me and I was lucky enough to see him live when he played in Greece for the first time back in 2008. "I don't think I've ever heard more soulful playing and tone than Gary's. As one of your biggest fans, thank you for the great music you gave us. Gary Moore. RIP." Check out TG's tribute to the late, great Gary Moore (featuring some of his best known tracks, as well as a few buried treasures) in our Gary Moore timeline. 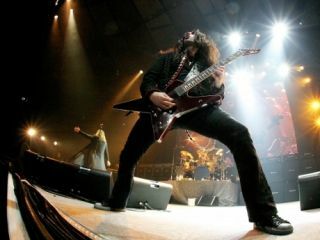 Gus G also features in TG's greatest metal guitarist poll.